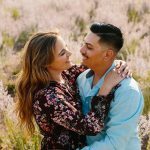 For their Garland Ranch engagement session, we strolled through a beautiful Monterey County park and ended with a gorgeous sunset over the mountains. A heatwave's hazy hot air gave us magical glowing late afternoon light for Kayla & Ray's Carmel Valley engagement session. From tender kisses to light acrobatics, Stephanie & Tony's Stanford engagement session was a perfect mix of romance and fun. 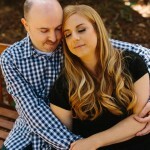 For Katie & Brian's Stanford University engagement session, we had many great settings: archways, columns, a grove of trees, a spiral staircase & more.